“Oi oi oi, oi oi oi oi, Pippo Inzaghi segna per noi.” The echoes may have faded from our ears, but they may never fade from our hearts. 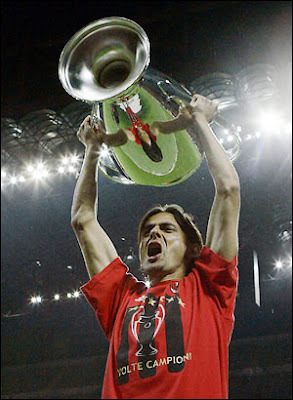 Pippo Inzaghi leaving Milan is one of those events you never quite forget, even if you’re not a Milan fan. And for Milan fans, it brings up powerful emotions of sadness and regret, but also joy and gratitude. I may not see him wearing the red and black again, but I will always be able to see him in my dreams. On and off the pitch, he has always displayed a personality that was larger than life, but more like George Clooney than Charlie Sheen, especially with the ladies. On the pitch, he was a poacher, a predator who was always hungry to score goals. It was painful to see him sit on the sidelines. Well, to be fair, he never sat. He paced like a caged lion, his desire to win more primal than cerebral. When he did score, whether it was a Coppa Italia qualifier or the winner in a Champions League final, there were the celebrations. Every goal was celebrated like a World Cup winning goal, from his epic sliding on his knees, to his shaking of the corner flag in primal ecstasy. I think that’s why some of us wanted it to be him to score, because he made us feel like we just won the World Cup, too. Off the pitch, he was a class act, as a teammate, a brother, an uncle, or a friend. In fact, I remember when he scored his 70th European goal to break the record, he rushed to his friend, Stefano Borgonovo’s side to celebrate with him. 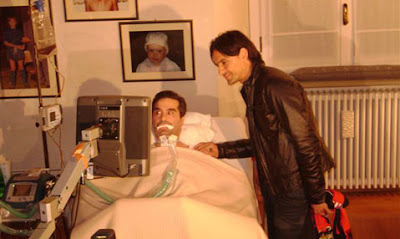 And although Borgonovo is stricken with ALS and not able to speak or move, you could see in his eyes what it meant to him for Pippo to come see him at this special time. He has done a lot of charity work, too, and on his days off, would do things like go and see children at a hospital. It’s hard not to love a guy like that. Super Pippo did not leave the club in the way that he had intended. How much of that was due to Allegri and how much was due to a terrible knee injury the season before, we may not know. But if he is bitter about ending his Milan career in this way, we may never know. He never complained, never went to the media, just always worked and always believed in the support from his fans. So when he finally made the decision to leave Milan, probably a decision made as much for the club as for him, he wrote an open letter to the fans. If that doesn’t make you tear up, then you may not even be human. He reminisces, but not too much, and thanks everyone who ever touched Milan, like a love letter someone leaves behind for their family when they know it’s their time to go. He also took out a full page ad in la Gazzetta dello Sport to thank the fans the day of the last match vs. Novara. He wrote, “At times, words are not enough, and thus leave room for thousands of emotions. Thanks, you will always be in my heart." The feeling is mutual, Super Pippo, I promise you. It is perhaps his relationship with and understanding of the fans that makes him such a unique player. He understands the symbiotic nature of this relationship – that the fans feed you and you feed the fans, and that is where the true beauty of the beautiful game comes from. He even received a special award from the Milan Ultras following the Novara match. ...so Superheroes really do exist. 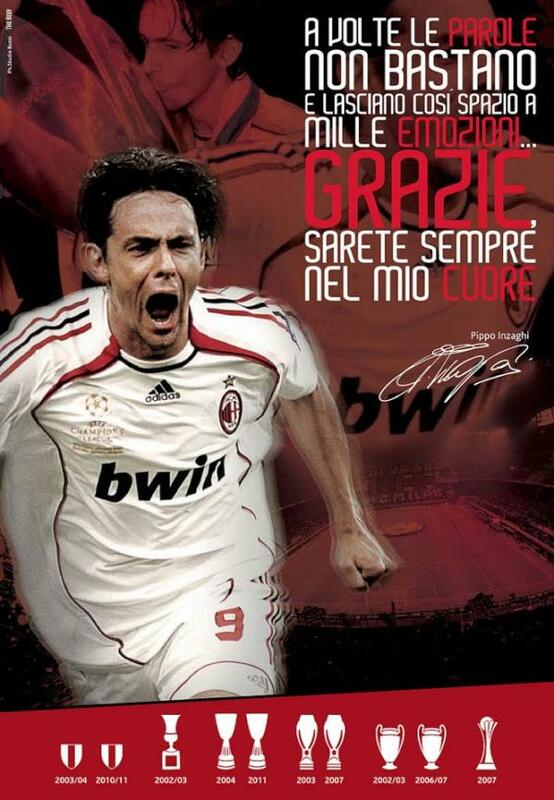 Ciao Pippo"
But his understanding of the beautiful game is more than meets the eye, too. At first glance, he seems like a striker who will just simply get the ball into the back of the net, whether it is pretty or not. But in the animal kingdom, it is the predator who exhibits the must cunning and intelligence, that is why he is at the top of the food chain. And so I maintain that it is a prima punta like Inzaghi who perhaps understands the game the best. Certainly, Stramaccioni, who was at Coverciano yesterday seems to think so. He said, "I'll give you a surprising hint for the future: hire Pippo Inzaghi as a manager. His tactical ideas surprised me." Pippo has said that he is not sure yet if he will pursue another year on the pitch or not, he’ll make his mind up at the end of this coaching course he is currently taking at Coverciano. But he has also said that he would like to return one day to Milan, perhaps as a Director. I can only hope that he would be welcomed with open arms, I know as a fan, nothing could make me happier. Just Novara? 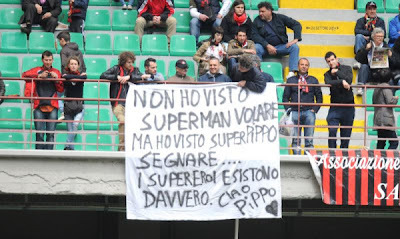 Not to Super Pippo. When rumors were flying that he might leave the club in January, I tried to prepare myself for this. But now that he has actually left, I still find myself completely unprepared. I still almost expect to see him next year, pacing the sidelines or being called offside for the hundredth time in a match. 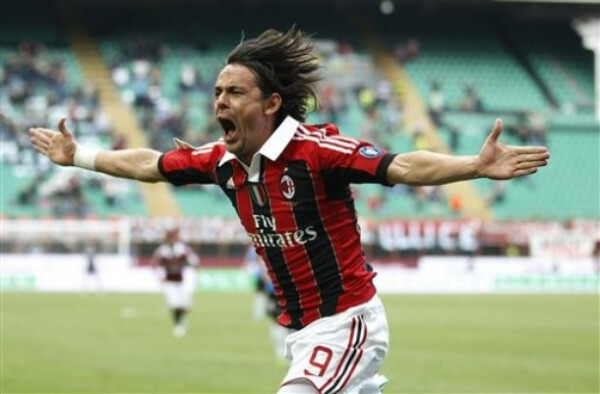 “Oi oi oi, oi oi oi oi, Pippo Inzaghi segna per noi.” A song I find myself still singing at random. But at least he left the club in style. Not only by thanking the fans for supporting him in his 11 brilliant years at the club, but by leaving as only Super Pippo could: scoring the winning goal. Grazie, Pippo.